The 100 series is the entry level hot melt glue pot edgebander. The machines feature a quick melt (6 - 8mins) gravity fed glue pot. Combined with the user friendly operator controls the range presents an excellent solution for the smaller workshops. 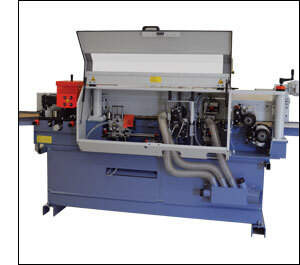 The 102SLK features end trim saws and high frequency top and bottom fine trimming station with rapid changeover from 0.4mm to 3mm. The 104SLK has in a addition profile edge scraper and buffing station to further enhance the finish achievable for 3mm PVC. Both machines benefit from a fully integrated centralized extraction system. Although the range of machines is classed as entry level, it still benefits from the attention to detail and general build quality associated with the larger products from EBM.